Wakhi is an Indo-European language in the Eastern Iranian branch of the language family spoken today in Wakhan District, Afghanistan and also in Northern Pakistan, China, and Tajikistan. Wakhi is one of several languages that belong to the areal Pamir language group. Its relationship to the other Iranian languages is not clear; in certain features Wakhi shows affinity to the extinct Saka language in particular. In the Wakhan Corridor of Afghanistan, Wakhi is spoken from Putur, near Ishkashim, to the upper reaches of the Wakhan River. In Tajikistan the Wakhi and other communities that speak one of the Pamir languages refer to themselves as Pamiri or Badakhshani and there has been a movement to separate their identity from that of the majority Persian-speaking Tajiks. Linguists universally refer to Wakhi as an East Iranian language independent of Tajik Persian, but many Tajik nationalists insist that Wakhi and other Pamir languages are actually dialects of Tajik. In Gilgit-Baltistan Wakhi is spoken in the sparsely populated upper portions of five of the northernmost valleys: Hunza (many ethnic Wakhi of this valley now speak Burushaski), Gojal that including the valleys of Chipursan and Shingshal, (Upper-Hunza—mostly intact), Ishkoman (many ethnic Wakhi speak, now, Shina), Yasin (many ethnic Wakhi of this valley speak, now, Khow-wor or Burushaski/Virchik-wor), Gupis (many ethnic Wakhi speak, now, Shina) and Yarkhun (many ethnic Wakhi of this valley now speak Khow-wor). Yarkhun is located in the Chitral district of Khyber Pakhtunkhwa, while others are in the Gilgit–Baltistan. Gojal, in the Hunza valley, has the largest Wakhi population of any of the above five areas. The Wakhis of Ishkoman live primarily in the Karambar valley, in the town of Imit and beyond. In Yasin, they live mostly in the vicinity of Darkot, and in Yarhkun, they are found in Baroghil and in a few other small villages in the high, upper portion of valley. In Pakistan, the central organization of the Wakhi is the Wakhi Cultural Association Pakistan (WCA), an organization that is registered with the Government of Pakistan and which works with the collaboration of the Ministry of Culture and Tourism and Lok Virsa Pakistan. The Association is working for the preservation of the Wakhi language and culture, as well as documenting their poetry and music. Radio Pakistan Gilgit relays the Wakhi radio programme "Sadoyah Boomy Dunyo", the voice of the roof of the world. The Wakhi Cultural Association has arranged more than twenty programmes since 1984, which includes cultural shows, musical nights, and large-scale musical festivals with the collaboration of Lok Virsa Pakistan, the Aga Khan Cultural Service Pakistan (AKCSP), and Pakistan television. In 2000, the WCA won a "Best Programme" organizer award in the Silk Road Festival from the President of Pakistan, Pervez Musharraf. A computerized codification of the Wakhi script has been released, which will help to promote the language development programme and documentation of Wakhi poetry, literature, and history. Wakhi is also spoken in the Taxkorgan Tajik Autonomous County, in Xinjiang of China. There are approximately 6,000 Wakhi in Russia, Most of them have migrated from Tajikistan and Afghanistan. There are some Wakhi villages in Turkey in the eastern regions, where they have migrated from Afghanistan in 1979 during the Afghan and Russian war. Traditionally Wakhi was not a written language. 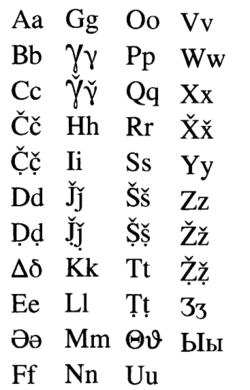 Writing systems have been developed for the language using Arabic, Cyrillic and Latin scripts. 2Yiso yavər x̆atəy: «Sayišt ʒi dəo carəv, x̆anəv: „Ey bzыrgwor Tat ki də osmonət cəy! Ti bəzыrg nung bər olam ыmыt! Ləcər dəwroni Ti podšoyi ɣ̆at-ət, zəmin-ət zəmon də hыkmi taw ыmыt! 2Йисо йавəр х̌атəй: «Сайишт ҙи дəо царəв, х̌анəв: „Ей бзыргв̌ор Тат ки дə осмонəт цəй! Ти бəзырг нунг бəр олам ымыт! Лəцəр дəв̌рони Ти подшойи г̌ат-əт, зəмин-əт зəмон дə ҳыкми тав̌ ымыт! 2And he said unto them, When ye pray, say, "Our Father which art in heaven, Hallowed be thy name. Thy kingdom come. Thy will be done, as in heaven, so in earth. 3Spo rыsq-ət rыzi sakər nəsib car! 3Спо рысқ-əт рызи сакəр нəсиб цар! 3Give us day by day our daily bread. 4Cə spo gənoən šəxs! Sak bə kuy, ki sakər šakiɣ̆, cə kərk! kыx̆tər baxṣ̌əṣ̌ carən. Cə bandi nafs-ət awasən, Cə waswasayi Iblisən saki niga δыr!“» 4Цə спо гəноəн шəхс! Сак бə куй, ки сакəр шакиг̌ цə кəрк! Кых̌тəр бахш̣əш̣ царəн. Цə банди нафс-əт ав̌асəн, Цə в̌асв̌асайи Иблисəн саки нига д̌ыр!“» 4And forgive us our sins; for we also forgive every one that is indebted to us. And lead us not into temptation; but deliver us from evil." The Wakhi lexicon exhibits significant differences with the other Pamir languages. Gawarjon's comparison of the dialects of Sarikoli and Wakhi spoken in China is reproduced below. meat ɡuʃt (گوشت) ɡuʃt (гушт) ɡuːxt ɡɯxt ɣwaxa, ɣwaʂa (غوښه) ɡuʂt ? tooth dændɒn (دندان) dandon (дандон) ðinðʉn ðanðun ɣɑx, ɣɑʂ (غاښ) ðɯnðɯk ? wheat ɡændom (گندم) ɡandum (гандум) ʒindam ʒandam ɣanam (غنم) ɣɯdim ? small kutʃik (کوچک) χurd (хурд) dzul dzɯl ləɡ, ləʐ (لږ) dzəqlai ? In Pakistan two books of Wakhi poetry have been published so far using Latin, modified IPA, script. The first book is a collection of Nazir Ahmad Bulbul's poetry entitled "Beyoz-e-Bulbul". The second book is a collection of old and new poems and folklores compiled by Bulbulik Heritage Center, Gulmit. ^ Hammarström, Harald; Forkel, Robert; Haspelmath, Martin, eds. (2017). "Wakhi". Glottolog 3.0. Jena, Germany: Max Planck Institute for the Science of Human History. ^ Payne, John (1989). "Pamir Languages". In Schmitt, Rüdiger. Compendium Linguarum Iranicum. Wiesbaden: Dr. Ludwig Reichert Verlag. p. 419. ISBN 3-88226-413-6. ^ Viires, Ants; Lauri Vahtre (2001). The Red Book of the Peoples of the Russian Empire. Tallinn: NGO Red Book. ISBN 9985-9369-2-2. ^ Wakhi Tajik Cultural Association report 1991–2001. Pakistan: Wakhi Cultural Association. 2001. ^ See the book online "The Kirghiz and Wakhi of Afghanistan in Turkey"
^ Ali, Haqiqat (1984). Wakhi Language. 1. ^ Gawarjon (高尔锵/Gāo Ěrqiāng) (1985). Outline of the Tajik language (塔吉克语简志/Tǎjíkèyǔ Jiǎnzhì). Beijing: Nationalities Publishing House. "Double oblique case and agreementacross two dialects of Wakhi" (PDF). Daniel Kaufman, Queens College, CUNY GC & Endangered Language Alliance.